In 2004, several company owners in the language industry began ALC to convene and discuss the issues and concerns they all share. This is the one organization where language company owners can find colleagues who understand their issues, help each other, continually improve the credibility and integrity of the industry and, at the same time, build and improve their companies. Make connections from around the world. Seize the opportunity to team up with others. Learn from other’s experiences – don’t reinvent the wheel! Stay current on the latest trends in the market. Keep up with commercial and government requirements. Have fun! Be part of a group that respects and supports each other – and loves to be together! 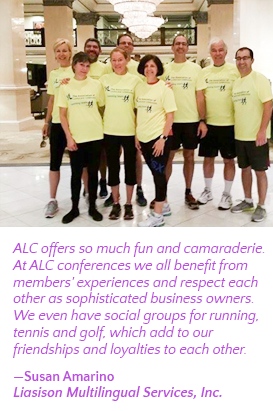 View a full list of ALC member benefits. If you are a private company that provides language services to clients anywhere in the world, you should join. If you are a government or educational institution with an invested interest in language services, you should join. If you are a company that provides tools, support, or products specifically to others in the language service industry, you should join. We need your expertise and your input. We want to add your voice to ours to become a bigger and stronger industry.